… a team of international cashmere lovers whose paths all led to London. We love the fact that everything we do involves creativity. Whether it is creating a cashmere dress or gift packaging or a woven label or an experience for our customers, we like to think about every single detail and ask questions like: Is it comfortable? Is it practical? Would it be an enjoyable experience? Founded in 2002 by Mongolian designer and creative director Oyuna Tserendorj and Swiss-Ecuadorian-British David Bernasconi, OYUNA is a product of a Mongolian nomadic heritage and the creativity of London. 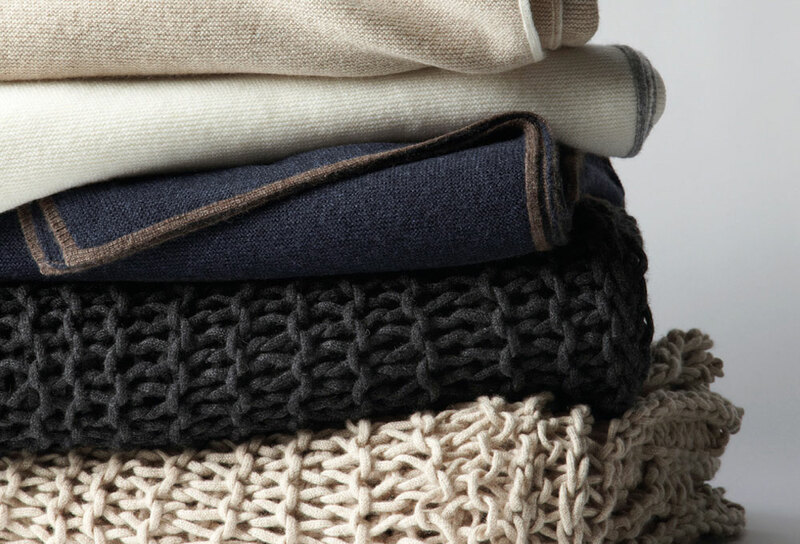 We thrive to take cashmere products beyond the realms of traditional knitwear by creating innovative and timeless luxury objects. Amidst their collection of fabulous looking home goodies, clothing and accessories, Oyuna sell an entire range of precisely the style of voluminous winter woolies that I like to swathe myself in, both indoors and out – much like, but a less exaggerated, more wearable version of, the Giles scarves I mentioned in a previous blog. Go across to the Oyuna Shop and snuggle up.